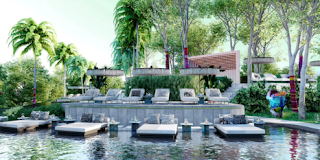 W Hotels Worldwide, part of Marriott International, Inc., today announced the signing of W Bali – Ubud, the brand’s newest W Escape. Developed in partnership with Indonesia’s Ruang Teknik Group, W Bali – Ubud is set to bring W’s bold design, signature Whatever/Whenever service and innovative programming to the cultural heart of Bali. Perched on a hilltop, oriented toward the morning sun rising in the east, and southwards over stunning, unobstructed views of the Tanggayuda Valley, W Bali – Ubud will reinvent the dreamy Ubud experience with eclectic, surprising art and design set amongst a versatile vibe that is at once laid back and social. No matter what guests crave – from sunrise meditation on a mountaintop to late night dancing under the jungle stars, every holiday spent at W Bali – Ubud will be filled with unforgettable magic. This expansion into Ubud marks the second W Hotel in Indonesia, following the opening of W Bali – Seminyak in 2010.